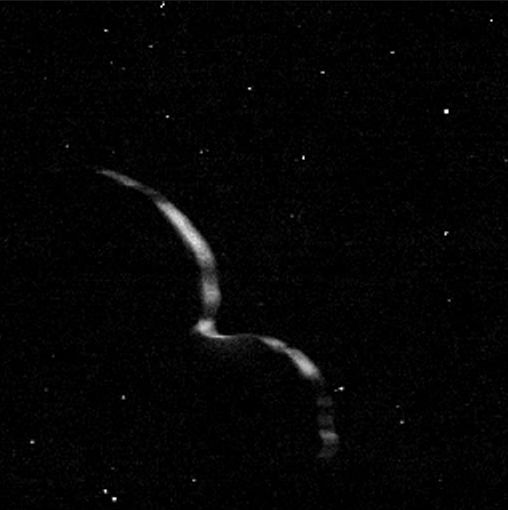 Mission scientists created this "departure movie" from 14 different images taken by the New Horizons Long Range Reconnaissance Imager (LORRI) shortly after the spacecraft flew past the Kuiper Belt object nicknamed Ultima Thule (officially named 2014 MU69) on Jan. 1, 2019. The central frame of this sequence was taken on Jan. 1 at 05:42:42 UT (12:42 a.m. EST), when New Horizons was 5,494 miles (8,862 kilometers) beyond Ultima Thule, some 4.1 billion miles (6.6 billion kilometers) from Earth. The object's illuminated crescent is blurred in the individual frames because a relatively long exposure time was used during this rapid scan to boost the camera's signal level – but the science team combined and processed the images to remove the blurring and sharpen the thin crescent. This is the farthest movie of any object in our Solar System ever made by any spacecraft. The images reveal an outline of the "hidden" portion of the Ultima Thule that was not illuminated by the Sun as the spacecraft zipped by, but can be "traced out" because it blocked the view to background stars also in the image.